This dress is made to order per each customers measurement. It has a built bustier for maximum hold and comfort. 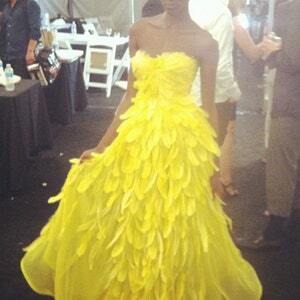 This is truly one of a kind couture dress. This dress has been worn by top celebs in Hollywood. Including Rutina Wesley of True Blood, Kendra, Melrose from top model and many more. IRINA SHABAYEVA COUTURE " Red Flower of Paradise" chiffon/feather gown.